Last day, after a few lessons of stirring up ideas related to packaging design and strengthening understanding of the concepts of surface area and volume, students were introduced to the unit project: Design a more effective pop box. Although we had previously focused on comparing the efficiency of different packages in terms of amount of material used and percentage of wasted space, for their design projects students could choose to focus instead on creating a more unique and interesting package if they felt it would increase sales. Students left the classroom buzzing as ideas already started to emerge. I opened the lesson with a brief review of the task. The students were anxious to start brainstorming and paid little attention to this introduction; some groups already had a variety of ideas to mull over and debate, and wasted no time in doing so. A collection of empty cans, kindly lent to the class by the recycling team, was made available for the students to manipulate as they debated various ideas. Large elastic bands were provided to hold groups of cans in place, if necessary; students scribbled and sketched their emerging ideas on whiteboards, taking photos of viable options as they went along. Little prodding was needed on my part, except with two groups. One claimed that they were done within two minutes, pitching a 4-can design that was otherwise identical to the regular box. I felt that they could do better, and after some discussion (Could you make it more efficient? What if I move these cans like this? ), they began considering other options. Another group sat stumped for quite some time, finding that all of the designs that they thought were interesting were not particularly efficient. I reassured them that they could choose to focus on one of these factors, but this suggestion was ignored – fortunately, because they ended up settling on an interesting flower-shaped design that also minimized empty space. Otherwise, my role was mainly to probe thinking about the reasoning behind the proposed ideas and to provide supplies as necessary (e.g., measuring tape, scrap paper). 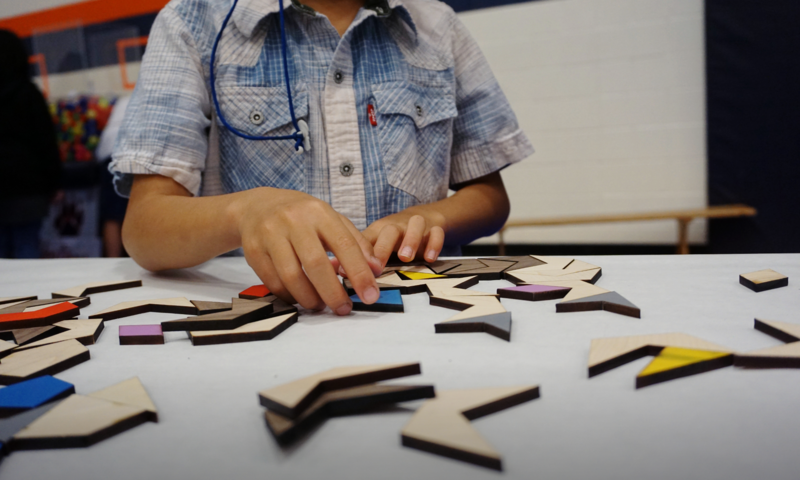 I was amazed with the variety of designs that emerged and with the engagement in the task – I happily observed students who are typically less engaged in class coming alive, even taking the lead in their groups in the brainstorming process. Some of the designs that emerged (not all of which were adopted) included a dumbell-shaped box, a fidget spinner box, a triangular box, a hexagonal box, a tube, a C-shape (for Coke), a Christmas wreath, a Coca-Cola Cake, an inuksuk, a circular 19-can design that minimized empty space, Tetris-inspired boxes (interestingly, this also came up in Nat’s class), and likely many other short-lived designs that were discarded for reasons of practicality or feasability. By the end of the period, many of the groups had a rough idea of a design that they would go forward with. Their next challenge would be to take accurate measurements and begin the task of bringing their idea to life. The room buzzed with productive activity as students made measurements, sketches, and computations. A variety of materials were made available (some borrowed from other classrooms as needed), including elastic bands, masking tape, glue, paper, rulers, meter sticks, compasses, protractors, and centimeter paper. I observed two groups independently make rough scale models of their design out of paper and tape, which helped them visualize where they needed to add flaps and what the box would look when it was flattened into a net. I briefly stopped the action to highlight this idea. The students were progressing at various rates, but no time was wasted. However, very quickly I began to lament not having saved quite enough time for this project, as I observed several groups discard an interesting idea for a more traditional design because of time restrictions (e.g., the Tetris and the wreath designs). If some groups rushed through certain phases of the project, it was my fault for not having provided enough time; this will be one of the changes next time around. Nevertheless, the designs were steadily taking shape. As students turned to the mathematics of surface area, volume, and empty space, I met with groups who were dealing with more complex shapes. 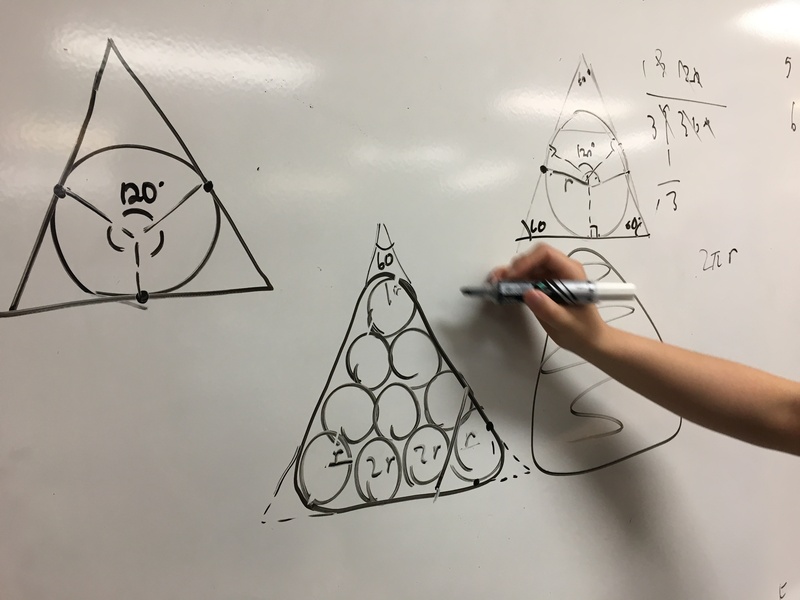 More often than not, the students were able to independently simplify complex shapes into more familiar ones by dividing them into polygons; other groups, especially those whose designs had rounded corners, found the mathematics to be more involved. One particularly interesting problem was finding the perimeter and area of a 10-can triangular design in which the cardboard wrapped around the cans. Initially, the group conjectured that the cardboard covered 1/2 of the circumference of a can in the rounded corners. However, when they compared their calculations with their actual measurements, they found that the numbers did not match (even taking measurement error into account). In my conversation with the group, they realized that their initial estimate was too large. “The cardboard would cover 50% of the circumference of an “end can” only if they were in a line,” they reasoned, and that if the cans were arranged in a square, 25% of the circumference would be covered by cardboard. So, for a triangle, they conjectured that the coverage would be somewhere in between – about one-third. Eventually, we proved that this was indeed true, which allowed us to find the total perimeter around the cans. When it came to finding the volume of the cans, again, students were not satisfied to (over-)estimate it by assuming that the cans were cylinders. They suggested using water; I had some Play-Doh on hand. Can you guess how we found a more accurate estimate? The lesson for me (and all teachers interested) is that we can still tailor a student-driven class around a content-driven curricula. In my next and final post, I will discuss the trade show, gush about my students’ final products, and share some final reflections about the project. For now, I leave you with a rubric that I provided students to refer to over the course of the project, which helped them keep track of the work done and the work still to be completed. It is also the rubric I will be using to grade their work.